The one exclusive thing that people love about Kolkata is its kathi roll, and the wide array of varieties available in thousands of roll shops all across the city, as well as the entire state of West Bengal. If history is to be considered, kathi rolls sprang into existence in the 1930s right in the heart of Kolkata, and over the last 80 years or so, has spread like wildfire in terms of popularity and fan following. You might find Kathi roll shops in Delhi, Mumbai and other cities, but those rolls cannot and do not hold a candle to the taste and variety of kathi rolls available in Kolkata – it is like a gift from God. The city of Kolkata is filled to the brim with roll shops, which makes kathi rolls available at almost every nook and corner. 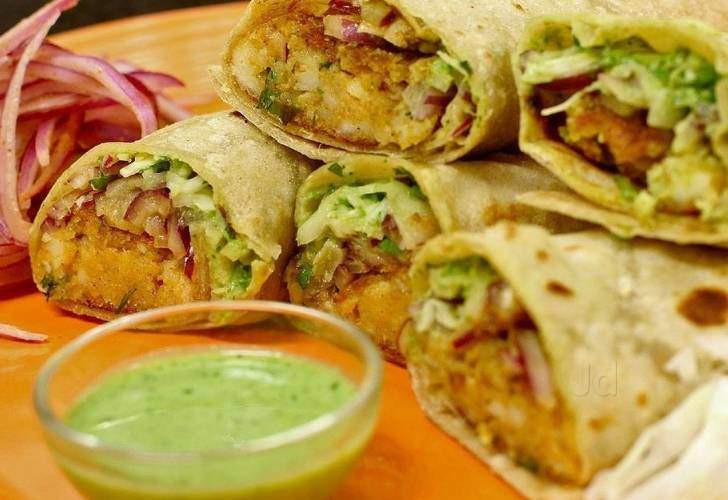 But which are the best kathi roll joints in Kolkata that warrant a definite visit? Today, we are going to take a look at the top 10 Kathi roll destinations of Kolkata, that serve a unique and wide variety of kathi rolls which taste simply heavenly. Read on to find out more. Located in the busy and bustling Gariahat area, Campari is a small fast food joint, which has been serving a variety kathi rolls over the last few decades. The shop has a huge fan following, with thousands of passers-by, office goers and school students lining up to grab one of their favourite rolls. The prices are quite reasonable, which makes the taste of these rolls even more heavenly. If you are living in Kolkata or just visiting, and are a food lover, then you must have definitely heard of Nizam and the kathi rolls the shop serves. Nizam has always been known as the pioneer of kathi rolls here in Kolkata, giving it a separate and exclusive status altogether. If you are in the New Market area, a visit to Nizam’s is definitely a must. The juicy filling inside the roll and the crisp exterior coating of paratha offered by Nizam’s kathi rolls is something worth dying for, and we mean that literally. Nizam’s first opened its doors in the 1900s, and it is a popular notion that they were the ones to invent the entire concept of kathi rolls, which is something definitely to be proud of. Located in the luxurious and historic Park Street area, Hot Kathi Roll has garnered quite a lot of fame over the last couple of decades, with long queues of people crowding the shop for the delicious and succulent kathi rolls, almost throughout the day. The variety of kathi rolls available at the shop includes paneer, chicken, mutton and even custom-madhi special kebab rolls, which are simply heavenly. Similar to Nizam’s, Hot Kathi Roll has been in and around for quite a long time now, with its customer base always increasing. The one unique factor about Hot Kathi Roll is that it offers abundant filling in each of its rolls, which is great news for roll lovers. Located in Nabapally in the Kasba area of South Kolkata, Roll Onn has garnered quite a bit of popularity by offering unique and succulent varieties of kathi rolls. Although Mughlai and North Indian dishes find place on their menu card, their primary item is the kathi roll. They have three unique categories of kathi rolls, namely Jambo, Mambo and Rambo, with a variety of rolls like double egg chicken cheese roll and paneer roll belonging to each category. Located in Park Street near the Park Hotel, Kusum is one of the many legendary kathi roll destinations of Kolkata. The kathi rolls served at Kusum are a perfect balance of capsicum, onions, chillies, sauce, and the secret special masala which makes the roll even more succulent and tasty. The roll joint won the best kathi roll joint award from the Times Now group, which gives this roll shop a special feather on its crown. Along with traditional non vegetarian rolls, Kusum caters to vegetarians of Kolkata as well, with a variety of vegetarian kathi rolls on its menu. If you are looking for a grab and go kathi roll shop, then Golden Spoon is the perfect place to be at. Although the eatery is listed as a North Indian and Chinese restaurant, it has always served some of the finest kathi rolls in Kolkata, including their signature Egg Paneer Roll, which is confusing as well as delicious. Located on Middleton Row, Golden Spoon is one of the prime kathi roll destinations of Kolkata. Parijat Restaurant, located in the Chowringhee area, is famous all over the city of Kolkata for its delicious and succulent double egg chicken kathi roll. It is believed that one double egg chicken roll, with its crispy yet flaky paratha and succulent kebab filling, will definitely not be enough for you, and you will have to visit again for more very soon. One cannot complete a kathi roll food tour around Kolkata without visiting Zeeshan in the Park Circus area. The wide array of kathi roll variants served by Zeeshan, including simple egg rolls to double mutton rolls, will leave you wanting more. We recommend their brain egg roll, which might be an acquired taste, but is definitely delicious. Do visit the eatery if you are in the area. Anamika has a total of 24 variants of kathi rolls on its menu, which makes it one of the top kathi roll destinations of Kolkata. You can order a variety of kathi rolls here, including potato and egg roll, and double egg double chicken potato roll, which is considered to be Anamika’s prize winner. The place only offers takeaway, but that does not stop roll lovers from crowding the place and ordering their favourite kathi rolls. For the last decade or two, Azad Hind Dhaba has been serving some of the most delicious kathi roll variants right in the heart of Kolkata. Some of the delicacies include rumali egg bhurji roll and mutton seekh roll, both of which are crowd pleasers from every angle. You can also get your hands on rumali notice kebab roll and egg mutton banjara roll to truly understand the magic of Azad Hind Dhaba.